The "Take it!" was an after thought as wanted to have a memento photo for my Niece and her family when they made a visit to DC from their home in Memphis. I taped their Christmas Card photo up on the outside front door with a little note of welcome and to come on in. 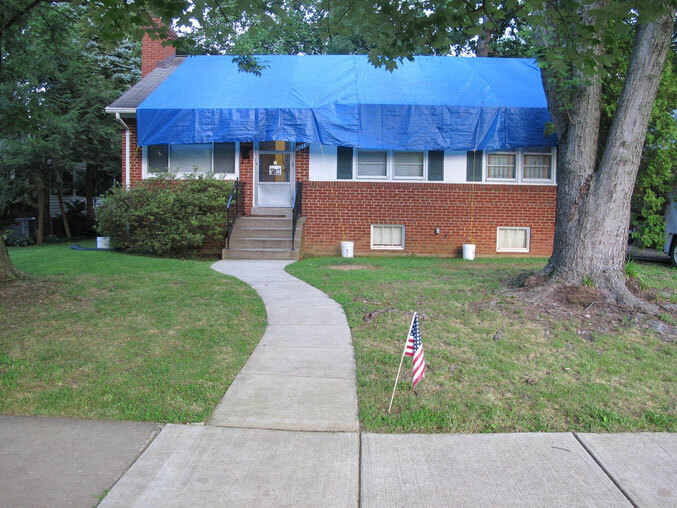 I had told them in advance that my house was the only one in the neighborhood that had a tarp over the roof - thus could be easily found. The reason for the tarp is simple. I have a leak in my roof. It is just one of those things that does not go away - it only gets worse. In this case - the leak actually made its way through the dining room ceiling and coursed its way down the chandelier to drip off the bottom of this light fixture. A big pot was placed in the center of the dining room table to catch the unwelcome water. The dripping was loud enough that at some times - it could be heard through out the house - lol. I got several bids for a new roof and accepted one of the offers. I then told the salesperson that I wanted my roof covered until they could schedule the work to be done. He looked at me - like I was nuts. I helped him understand - that we are having rain almost every day - and I did not want to wait for it to stop raining for me to stop enduring the pain of the leaky roof. Plus there was the potential for damage to increase with each passing rainy day. It helped that I already owned a full house coverage sized tarp. He called upon a few of his friends to come and put the tarp in place. It has been three weeks since the tarp has been on the roof. In all of this time - I have not heard that awful drip plus had the extra benefit of an awning effect shading the front windows - when the sun makes its sometime appearance. While this is not the look the neighborhood wants - I think they can understand that help is on the way. I am also having the lawn mowed on a very regular basis - so that they do not have to rent a herd of goats to help clean up the scourge of the neighborhood - lol. The After Take: Even though it cost me over $300 for the temporary fix - it has been worth every penny in the piece of mind it has brought me. I have to also tell you - that the placement of the tarp onto the roof by the two friends of the sales person, with me as and observer - was hilarious. I know they did not think of themselves as a comedy team - but they were. Great fun. I now have an appointment for the installation in the middle of next week. I hope it stops raining for long enough for them to clear off the old roof and put on a new one. This has been another lesson in "stopping the pain" until the real fix can come along. One could easily conclude that it is very important to tackle the problem asap before the pain makes the whole thing even more difficult to bear. How funny, that is very innovative. Man that tarp is huge, probably like 4 times bigger than the one i have. I may have to give this a try. My roof is getting pretty old. I dont think its quite leaking yet but any day now. Well, thank god you got that fixed. It might be an eyesore but the peace of mind is worth it!